Your phone is ringing and it’s a call from your real estate agent. You brace yourself – is it another lowball offer from a buyer expecting a “deal”? 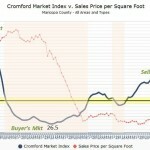 Key Differences exist between the crash of 2008 and today’s buyer’s market. Some of our sellers have been frustrated with lowball offers from buyer’s. Unfortunately, with it being a buyer’s market, buyers are under the wrong impression that prices are falling and they are going to get a deal if they wait it out. That simply is not the case in most instances and buyer’s agents must educate their buyers as to the true value of a home. And, buyer’s need to be willing to listen to their agent and understand today’s market if they truly want to purchase a home. So what are some of those differences? Desperation of sellers – There are far fewer desperate sellers today than in 2008 and 2009. The buyer’s market that defined a 3-1/2 year period from 2006 through mid-2009 was fueled by sellers who were desperate to sell their homes. Many had already defaulted or were at risk of default. That is not true today. In fact, Arizona has one of the lowest delinquency rates in the nation. Lender-Owned and Short Sale Properties have decreased – 70% of sales by 2009 were either foreclosures or short sales. Competition was tough traditional sellers wanted to list their homes and many were forced to accept low offers. Today, only 12% of the sales are distressed and that number is declining which places little stress on sellers to discount their homes today. Job Market Outlook – Arizona’s unemployment rate began to increase by by 2010 it was at the peak at over 10%. As of April, Maricopa County’s unemployment rate was 5.2%, similar to where it was in 2003. Declining unemployment is a positive trend that stabilizes supply and demand. If you are thinking of selling contact The Kolb Team – experts in Sun Lakes Arizona and active adult communities in the East Valley. We can offer a competitive market analysis to help you accurately price your home and our sellers tell us our negotiation skills are second to none. Let the Kolb Team expertise go to work for you!